The weather cooperated, the Boardwalk at the Pantry was an ideal location, the set design (by Nadia Khan) was commendable. There were a few technical hitches (at least one major protocol faux pas), but all told, the 17th staging of the International Theatre Institute’s Jamaica Chapter Actor Boy Awards was an enjoyable evening. The theatre fraternity and its supporters turned out in good numbers and dressed the part. While maintaining its main focus of honoring the best in Jamaican theatre in the technical, creative and performing spheres, this installment of the ABAs had a special additional spotlight: the Special Award for Theatre Achievement presented to Oliver Samuels O.D. The comedian, actor, producer, and director was in fine form while accepting his award. His speech was classic Oliver: warm, effusive, and honest — sweetened with humour and unabashed laughter. This proud son of Tremolesworth, St. Mary gave thanks, reminisced and celebrated this recognition of his more than 40 years in Jamaican theatre with gracious humility that warmed the audience. 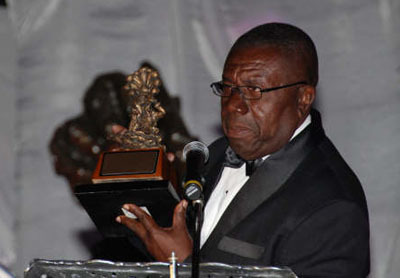 The award was a fitting corollary to the Best Actor in a Lead Role that Samuels had won earlier in the proceedings for his role in the JamBiz International production River Bottom. His female counterpart was the stunningly outfitted Dahlia Harris for her highly acclaimed performance in Aston Coke’s Concubine?. The Best Supporting Actress and Actor awards went to Nadean Rawlins (Disco Inferno) and Glen Campbell (Love Games). Both were nominated twice in that category. Other awardees were: Trevor Nairne & Patrick Brown (Best Director, River Bottom), River Bottom (Best Production), Paula Shaw (Best Choreography) and Andrew Roache’s Strength of a Woman (Best New Jamaican Play). Jamaica Youth Theatre won the Best Drama award (being the sole nominee) for Man Better Man, Jamaican Style. Co-hosts Karen Harriott and Christopher McFarlane added sparkle and a bubbly repartee to the evening, while Michael Holgate and Michael Sean Harris’s opening number was a triumph, setting the stage for two stellar performances from Cherine Anderson and Nomaddz.